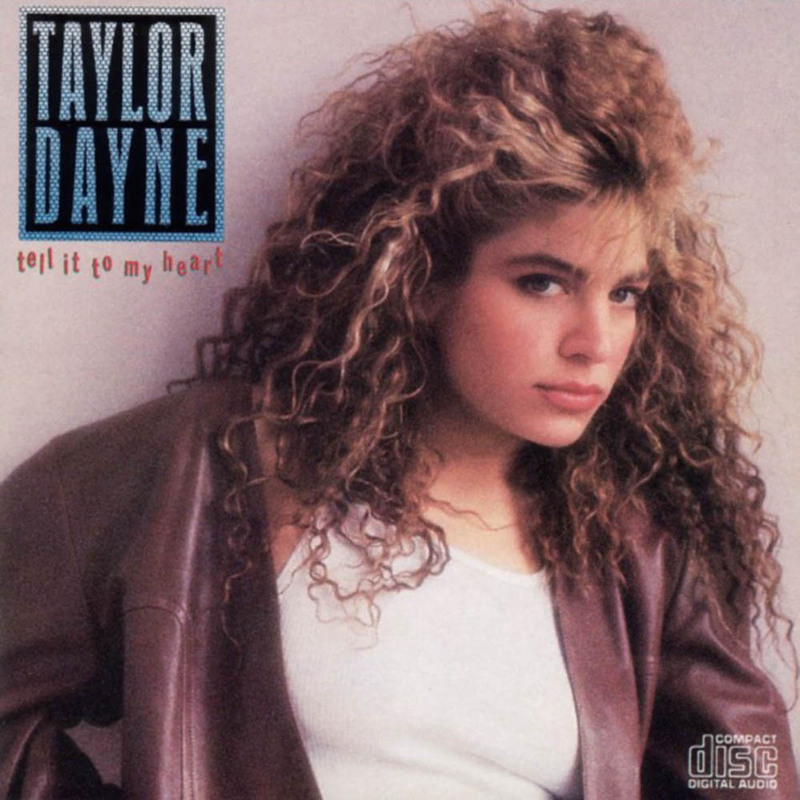 Today’s POP RESCUE from obscurity, is the 1988 re-issue of the 1987 Taylor Dayne album, Tell It To My Heart. The album opens up with the wonderful tinkling synth line of big lead hit single and title track, Tell It To My Heart. But soon you find that this song is an absolute belter that really encapsulates late 80s pop with busy beats and synths. Taylor doesn’t hold back here and she really has a fantastically powerful voice over this roaring anthem, sounding a little like Tina Turner with her 80’s pop-rock vocals. This is followed by In The Darkness, a mid-tempo track, that reminds me a little (in bouncy bass) of something you’d find from the title track of Madonna’s True Blue album. And, just as expected, Obligatory 80s Saxophone gets a solo about 2/3rds of the way through. Fourth and final single Don’t Rush Me follows, starting with some great stabbing bass and a sigh before Taylor turns up with some deep vocals. The song builds perfectly, along with her vocals, for the chorus. This chorus is perfectly catchy, and it gives her plenty of room to show off her vocal range. It’s a simple track, but it works really well, giving a short guitar solo before the final push. Sadly this song stalled at #78 in 1988, returning to the chart just a few months later, and reaching #76! Oops. Third single I’ll Always Love You is hot on the heels, and this time gives us a slow ballad. A soft beat and keyboard section is joined by some ‘oh oh-oh-ohhhh‘ vocals from Taylor. Here, Taylor’s vocal performance reminds me a bit of Lisa Stansfield. Sadly, it turns out to be a bit of a dull song, and the single stalled in the UK at #41. The pace picks up for second single Prove Your Love. This is a worthy follow-up for the debut single, and is equally as catchy. Again, there’s plenty of guitar solo, and the synths and beats are busy in overload too – leaving us with an great energetic track – musically and vocally. Even the key change just seems to rev the little engine for this song, as Taylor continues to show off that voice of hers. A perfect follow up, that gave her her second and final (so far) top ten UK hit, reaching #8. Do You Want It Right Now is up next and the synths are back in after a drumroll, and the track starts bounding along. Then I realise, that even though Taylor didn’t release this as a single, I recognise this song instantly as Taylor begins singing – this song has been covered in 1991 by Degrees Of Motion, and was used as the main inspiration for Armand van Helden‘s 2007 hit I Want Your Soul. This is a fantastically catchy song, and one that really should have given Taylor her third hit single. I’m pretty surprised she hasn’t returned to it herself. We’re back to a power ballad for Carry Your Heart, which opens with some gentle guitar, which gives away to some keyboard bass and an 80’s power ballad beat. Taylor’s Tina vocals return, giving this a great rock feeling. Thankfully this song builds well, with some really nice vocal harmonies helping her to lift her vocals up. This is the kind of song you could easily expect to turn up on something like the Pretty Woman soundtrack. This is followed by Want Ads a bouncy track that reminds me musically of The Jackson‘s hit I Want You Back. Lyrically, Taylor’s making her claim as to what she wants from a man, singing “Experienced in love, preferred, but will accept a young trainee“. It’s up-beat sound and fun lyrics result in quite a catchy track, and again this would probably have given her another hit if she’d been able to release it instead. Penultimate track Where Does That Boy Hang Out sounds like it belongs to a 60’s group, with it’s beats, backing vocals and because it’s loaded with brass. This is catchy as hell, and I can almost imagine the stylised video. Obligatory 80s Saxophone puts in another appearance before the song leads into the final third. Once again, this could easily have given her another great single. The album closes with a great big ballad in the shape of Upon The Journey’s End. Here, Taylor’s vocals are joined by Billy T Scott and this combination is absolutely perfect – two different sounds but wonderfully complimentary. Both vocalists seem to work off of each other, helping the song to build up and up to the perfect ending for the song, and indeed the album. A lovely track. Over all, I was impressed by just how rocky Taylor’s vocals were throughout this. She would have been about 25 when this was released, and yet she’s roaring through these songs with a great big powerful vocals and oozing with confidence. Sadly, the weak I’ll Always Love You, and the strangely unpopular Don’t Rush Me were perhaps misguided choices as singles and there’s at least three other contenders here that could have brought her much greater success. Where is Taylor Dayne now? After the success of singles Tell It To My Heart and Prove Your Love, Taylor didn’t find herself in the UK top 40 singles chart until 1993, where she scored a #14 hit with a cover of Barry White’s hit Can’t Get Enough Of Your Love, and followed this up the following year with a #23 hit with I’ll Wait which featured in the Disney movie Blank Check (1994). Both tracks came from her 1993 third album Soul Dancing. Her most recent charting UK single was a re-release of Tell It To My Heart, which gave her a #23 hit in 1996, although she has continued to release singles since. Her most recent album was her fifth – 2008’s Satisfied. Only this album has ever charted in the UK. Her greatest album chart success has been in Australia and Sweden, rather than her native USA. Cherry Red Records re-issued the album in 2015 as a double CD, featuring bonus tracks and remixes. POP RESCUE COST: £2.99 from an eBay seller. Posted in 1980s, Taylor DayneTagged 1988, album, Armand van Helden, Billy T Scott, Degrees Of Motion, Do You Want It Right Now, Don't Rush Me, I Want Your Soul, I'll Always Love You, Prove Your Love, reissue, review, Ric Wake, Tell It To My HeartBookmark the permalink.